This floral tapestry "Bouquet Exotique" shows the detailed and beautiful work of Dutch painter Jan Frans van Dael (1764-1840). Van Dael gained success and won the gold medal at the official art exhibition of the 'Academie des Beaux-Arts' in Paris was the largest annual art event in the Western world in the 18th to 19th century. His works are said to be reminiscent of the works of Van Huysum, another Dutch master flower painter. Focusing on flowers, Van Dael painted works for patriots such as Empress Josephine. In this tapestry we see a gorgeously detailed floral arrangement with roses, tulips, daisies and forget me nots, as well as fruit and a violin on an exotic background of ruins and palm trees. The exotic was beginning to become a fascination for European artists in the 18th century as travels to Asia introduced elements of the Orient which was quickly incorporated into the art of the Western European countries. The balance of composition as well as colors is a signature of van Dael's works. 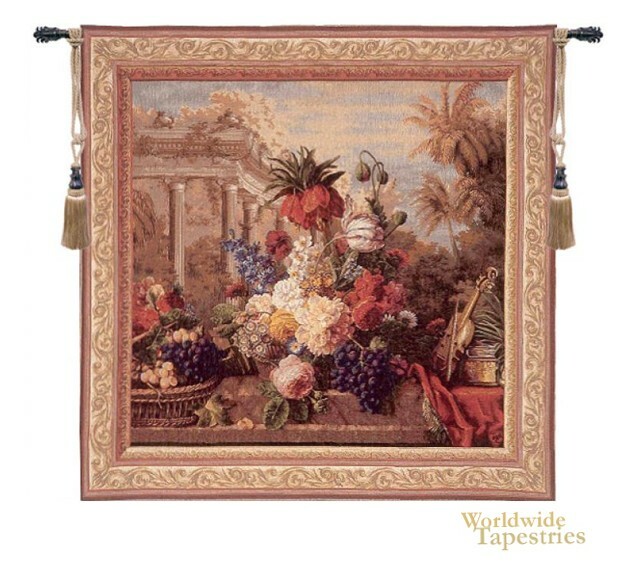 This floral tapestry "Bouquet Exotique" is backed with a lining and has a tunnel for easy hanging. Note: tapestry rod and tassels, where pictured, are purchased separately.